. Bollag DM, McQueney PA, Zhu J, Hensens O, Koupal L, Liesch J, Goetz M, Lazarides E, Woods CM. Epothilones, a new class of microtubule-stabilizing agents with a taxol-like mechanism of action. Cancer Res. 1995 Jun 1;55(11):2325-33.
. Lin B, Catley L, LeBlanc R, Mitsiades C, Burger R, Tai YT, Podar K, Wartmann M, Chauhan D, Griffin JD, Anderson KC. 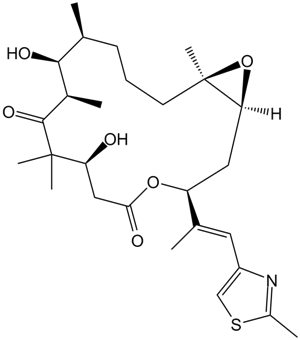 Patupilone (epothilone B) inhibits growth and survival of multiple myeloma cells in vitro and in vivo. Blood. 2005 Jan 1;105(1):350-7.
. Regueiro-Ren A1, Borzilleri RM, Zheng X, Kim SH, Johnson JA, Fairchild CR, Lee FY, Long BH, Vite GD. Synthesis and biological activity of novel epothilone aziridines. Org Lett. 2001 Aug 23; 3(17):2693-6.
. Rogalska A1, Gajek A2, Marczak A2. Epothilone B induces extrinsic pathway of apoptosis in human SKOV-3 ovarian cancer cells. Toxicol In Vitro. 2014 Jun; 28(4):675-83.